Raccoon Mario (spelled Racoon Mario in Super Mario Bros. 3's manual) is a form Mario turns into after acquiring the Super Leaf, and as of New Super Mario Bros. 2, Luigi's form is called Fox Luigi. First seen in the game Super Mario Bros. 3, this form allows Mario to slowly float down when falling, using his tail. Mario can attack enemies with his tail by spinning. He is also able to briefly fly if he runs for a short time and then jumps. A related form is Tanooki Mario (which it is often mistaken for), which adds a statue transformation to these abilities. In Super Mario 3D Land, some enemies are also powered-up with Super Leaves, becoming "Tail" versions of themselves. Raccoon Mario is first introduced in Super Mario Bros. 3, where Mario transforms into Raccoon Mario by obtaining a Super Leaf. When Mario is in this form, he can use his tail to slowly float down (by tapping ) or fly for a while if he fills the Power Meter (by running) beforehand, and tail whip enemies and blocks (by pressing ). A Magic Wing will also transform Mario into Raccoon Mario, but with infinite flight. The benefit of a Magic Wing will be lost once Raccoon Mario takes damage, transforms into Fire Mario, Frog Mario or Hammer Mario, or clears a level, the latter method reverting Raccoon Mario's flight to normal. However, Mario keeps the Magic Wing's infinite flight if he turns into Tanooki Mario. Raccoon Mario was going to appear in Super Mario World, but it was abandoned. In the SNES Test Program, Mario's graphics show him with the standard Raccoon tail and ears found in Super Mario Bros. 3, which were also seen in preview images for Super Mario World. The transformation was ultimately cut and seems to have been replaced with the similar Cape Mario transformation in the final game. Even though Super Leaves return in Super Mario 3D Land, Raccoon Mario does not, though it was considered for the game; instead, it was passed over for Tanooki Mario, for visual clarity. 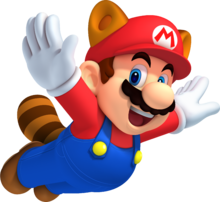 The Tanooki form given by Super Leaves acts as Raccoon Mario does, but without flight. Raccoon Mario returns in New Super Mario Bros. 2, but Luigi's Raccoon form is now Kitsune-themed (like his Tanooki form in Super Mario 3D Land) and called Fox Luigi. The mechanics are somewhat different from Super Mario Bros. 3; the player can now simply hold the jump button instead of repeatedly pressing it for Mario to ascend and slowly descend, much like with Cape Mario. The tail whip is also quicker, usable underwater, and able to hit more enemies, like Dry Bones (which are immobilized but not killed as they were with Cape Mario). After being charged, the Power Meter now visibly decreases to show the amount of remaining flight time, but once Mario lands on the ground, it will be refilled. However, if he enters a Warp Cannon stage, he can fly almost indefinitely (if he repeatedly lands on platforms before the Power Meter runs out), much like when using a P-Wing. Also, White Raccoon Mario (the counterpart of White Tanooki Mario from Super Mario 3D Land) debuts in this game. In addition to this form's abilities, it gives Mario invincibility for the stage, lets him walk on water (like his Mini form), and makes the Power Meter charge much faster than normal. Unlike the White Tanooki form, however, the White Raccoon form can be regained by losing five lives in a level, even after the level or final boss is beaten. Raccoon Mario returns in Super Mario Maker and Super Mario Maker for Nintendo 3DS, where it is exclusive to the Super Mario Bros. 3 style, functioning identically as it did in that game. Also, knocking on a Warp Door in the Super Mario Bros. 3 theme may cause Weird Mario to appear in this form. A form of Raccoon Mario appears in Paper Mario: Sticker Star, in that by using a Tail sticker, Mario is given a raccoon tail to deflect enemy attacks. However, using the sticker only overlays it behind Mario, instead of turning him into Raccoon Mario. Bowser Jr. is particularly vulnerable to it in his third and final battle. A shiny variant of this sticker also exists, giving Mario a rainbow-colored tail and a stronger counterattack. In Paper Mario: Color Splash, using a Tail card fully transforms Mario into Raccoon Mario, unlike in the previous game; he still deflects enemy attacks with his tail. It lasts until Mario takes damage or wins the fight. At least a few of these cards are required at the beginning of the boss fight with Ludwig in order to counter the cannonballs fired from the Ludship. 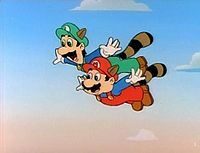 In The Adventures of Super Mario Bros. 3, Toad and Princess Toadstool also transformed into Raccoon Toad and Raccoon Toadstool using Super Leaves, and in one instance, P-Wings. In the episode "Super Koopa", Bowser uses the Power Pendant to become Raccoon Koopa. On several occasions, the form is referred to as Raccoon Power. 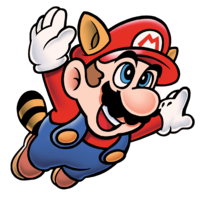 Mario briefly transforms into Raccoon Mario once in the Nintendo Comics System, in the story "It's Always Fair Weather" (which takes place before the events of Super Mario Bros. 3). Mario gains the ability by using a piece of a plant labeled as "Magic Leaf Raccoonias" for a toothpick and then uses his new-found ability to save some hot-air balloonists trapped in a cyclone that Bowser creates. In the Club Nintendo comic "Marios Rückkehr," Mario somehow turns into Raccoon Mario after jumping on two trampolines consecutively. He is flying over the Mushroom Kingdom when he finds two Nintendo Gamer's Guides on a cloud, accidentally hitting a Koopa Paratroopa and falling to the ground. A trophy of Raccoon Mario appears in Super Smash Bros. Melee. It becomes available in the Lottery after collecting 250 trophies. A Raccoon Mario sticker appears in Super Smash Bros. Brawl. When equipped in The Subspace Emissary, it boosts the user's flinch resistance by 112 points. In Super Smash Bros. for Nintendo 3DS and Super Smash Bros. for Wii U, the Super Leaf appears as an item, turning the player who grabs it into the Raccoon form and letting them briefly float by holding the jump button in midair. Like with most other equipable items, the player can lose this form if they are hit enough times or with a strong enough attack; it will also disappear after enough time has passed. This form's tail whip was considered during development, but it was later dropped. The Raccoon form returns in Super Smash Bros. Ultimate as an effect of the Super Leaf item, functioning the same as previously. In addition, Fox Luigi appears as an Ace-class support spirit, granting the fighter easier dodging when equipped. The spirit's battle involves facing Luigi in Raccoon form on the Mushroom Kingdom U stage. Raccoon Mario was created when Takashi Tezuka wanted a way for Mario to spin and knock away enemies with a tail. At first, the inclusion of a raccoon-like Mario made him worried, but he wanted this new action to implemented in some way. However, the spin was originally meant for when Super Mario Bros. 3 was still using a bird's-eye view, so adjusting the controls to a side-view was a challenge. Flying was a mechanic Tezuka wanted to add since Super Mario Bros., and Raccoon Mario ultimately ended up being able to do both. For this subject's image gallery, see Gallery:Raccoon Mario. In the Super Mario Bros. 3 manual and the Nintendo Power Strategy Guide, Raccoon Mario was misspelled as "Racoon Mario". Although Luigi's Raccoon and Tanooki forms are Kitsune-themed (as of Super Mario 3D Land), he is seen in Raccoon form in the Super Smash Bros. series to match the other characters. The sound effect for transforming into Raccoon Mario (and to a lesser extent Tanooki Mario) was taken from The Mysterious Murasame Castle. ↑ Henry Gilbert (March 9, 2012). Super Mario 3D Land interview - We talk with the director about secrets, Tanookis, and Mario's future. GamesRadar. Retrieved May 15, 2015. ↑ SakuraiMasahiroA (April 30, 2014). Pic of the day. With the Super Leaf, any fighter can have ears and a tail. You can also float in the air by pressing the jump button. We're still figuring out whether you'll be able to attack with the tail... Miiverse (October 17, 2017 snapshot via WayBack Machine). Retrieved July 11, 2018. ↑ Sao, Akinori. NES Classic Edition Developer Interview. Nintendo.com. Retrieved May 17, 2018. ↑ World of Longplays (August 12, 2011). NES Longplay  Nazo No Murasamejou. YouTube. Retrieved August 14, 2017. This page was last edited on April 12, 2019, at 16:06.